The Fit3D ProScanner – used in over 20 countries has produced hundreds of thousands of scans. Fit3D’s ProScanner is the most comprehensive, non-invasive assessment technology on the planet, with accurate body measurement, body composition, postural analysis and wellness assessment, all completed in under 60 seconds. The Fit3D ProScanner is simple to use and can be conducted in complete privacy. The user stands on the ProScanner platform (feet position is marked), holds the fixed handles, and stands up straight, with arms straight. 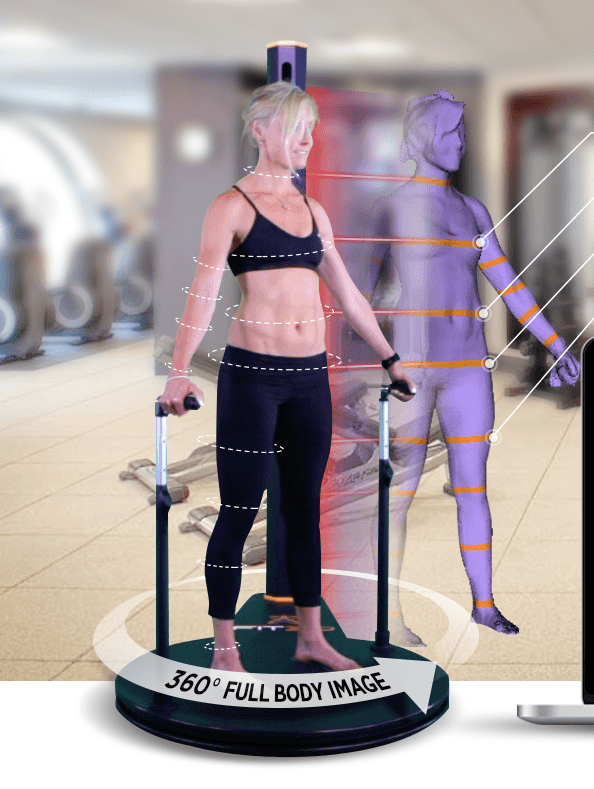 Standing still, and when ready, the user then starts the scan by clicking the start button on the handles, the ProScanner then rotates the user 360 degrees on the platform taking hundreds of photos gaining a complete view of the user’s body and piecing them together in a 3D Avatar along with taking hundreds of measurements in the process. This then all sits on a personal account via a cloud based platform that can be easily shared to coaches. Fit3D’s ProScanner is used in gyms, boutique personal training studios, allied health facilities and weight loss centres to track a member’s progress and provide accurate visual feedback, with measurable data. The ProScanner enables trainers to keep members on track to achieving their weight loss and fitness goals, increases member retention by providing the right feedback and motivation and supports allied health practitioners in rehabilitation prescription for post-surgical clients. The ProScanner is a great way to take the awkward, inconsistent, invasive and time consuming measurements out of the fitness assessment or consultation in a gym, ensuring that members feel safe, secure and comfortable. Tim Douge, Exercise Physiologist and Director at Iridium Health – a leading Allied Health Centre in Brisbane’s CBD – has said the Fit3D ProScanner assists their health practitioners to more effectively prescribe movement and rehabilitation programs to their patients. F45 training centres utilise Fit3D’s ProScanner to keep clients on track to achieving their weight loss and fitness goals. In particular, they use the ProScanner to track changes in body composition before and after 8 week challenges. “Keeping clients on track and accountable, is easier when you can visually show them what they are achieving”, says Scott Fava – ARU Wallaby and Owner of five F45 Facilities.